The title of her latest recording, Desire, simply hints at the passions that drive Lauren Mitchell, a commanding singer from Florida’s Gulf coast. 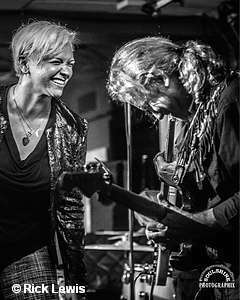 Nominated for two Blues Blast Music Awards this year – Soul Blues Album and the Sean Costello Rising Star Award – Mitchell is proud of her work on a disc that finally captures the full extent of her talents. She explains, “You are asking me to talk about the curse of an artist, whether you are a writer, visual artist, or musician. Do I feel it is a wonderful album – do I feel that it is the best representation of me to date? Yes! I am very, very proud of it. But I still listen to it and think, man. I wish we could have done this better. Just being overly critical of myself as an artist, that curse, propels me to work harder to achieve my goal to grow and evolve. Looking back over the last six years, this record shows that I have evolved, so I am doing my job”. Getting to this point has been proven to be a path with many twists and turns. Born In Columbus, Ohio, Mitchell was placed with adoptive parents when she was seven days old. It was fortunate that her parents had a love for music and the arts. Her maternal grandparents met when her grandmother auditioned as a singer for her grandfather’s country & western band. Both sang in the church choir, as did Mitchell’s adoptive mother and father, who also played some guitar. “I listened to a lot of great music while I was growing up. Dad had an impressive record collection, half of which is now in my possession. I got the sixties soul and cool rock & roll. My brother got the rest of it, the weird stuff like Frank Zappa”. “There was always music in our home. I remember hearing Ray Charles and Sam Cooke, a lot of Motown. My Dad was really in to Motown, like the Four Tops and the Temptations, and especially Gladys Knight. He took me to my very first blues festival, the Tampa Bay Blues fest, when I was in high school. It was fortunate that I grew up in a school district that I lived in had a performing arts school that I auditioned for and was accepted into in fourth grade. It was part of the public school system, so there wasn’t any extra tuition”. “I started professional voice lessons at age nine. Mom found me an incredible teacher in Canton, OH, Michael Canastraro, who I studied with through most of high school. He taught me pretty much everything I know about the voice and the mechanics of singing. He was very strict. I wasn’t allowed to sing in his studio in English until I mastered singing in Italian. We worked on a lot of opera and art songs. But I was still hearing soul music at home plus blues from Muddy Waters, Leadbelly and Sonny Terry & Brownie McGhee. So I was doing Mozart, Puccini, and Verdi in Micheal’s studio, then going home to listen to gut-bucket blues”. “The lessons taught me a good portion of singing is your breath, being able to use all of the available muscles to raise and expand the rib cage. The cage opens, giving the lungs more room to expand. Then you have to fully breath into the diaphragm, using the muscles in the lower abdomen to control the airflow that comes up through the esophagus to the vocal folds. They are very thin and extremely fragile, like tissue paper. That is why singers have problems from abusing their voice. Controlling the flow of air through the vocal folds is what creates vibration and sound. I also learned ways to shape the mouth, move the tongue, and adjust the soft palate to create different sounds. Mitchell continued to study and perform while in college, doing musical theater, sang in choirs, and did solo work singing arias and art songs. Another voice instructor, Steven Monroe, re-introduced her to some of the hip music she heard during her childhood, and had Mitchell listen to Nina Simone, Sarah Vaughan, and Ella Fitzgerald. ‘When I was younger, I was singing in the lyric soprano range, way up in the rafters. That is not the case any more. The female voice does not typically mature and become what it is supposed to be until around the age of forty. So it is no shock that my voice now is in the basement. I sing lower than most women, and even a few men! Steven was into the fact that I had that lower register. He thought it was unique and encouraged me to develop it. I also identified a bit with Janis Joplin. I discovered that I had really big lungs and had lots of power behind my voice”. Out with some girlfriends one night for some under-age drinking, Mitchell was convinced to participate in a karaoke contest, singing one of the Joplin tunes she knew. The broke college student ended up winning the contest and the $100 prize. “Up until then I had only been paid for a few theater gigs, as a chorus girl because I used to dance. I had never been paid for just singing. So I started singing with a couple bands around Columbus. Then in 2003, a really, really bad break-up made me decide to move to Florida. My parents had split up and my Dad had fulfilled his dream by moving to Florida. I had a girlfriend who was moving to Orlando, so we got a bigger truck. The night we moved, there was a foot & a half of snow. Moving a box of books, we both fell down in the snow. All we could do was laugh as we realized we would never have deal with that again”. The singer worked as a bartender in a series of clubs, some of which featured live music. 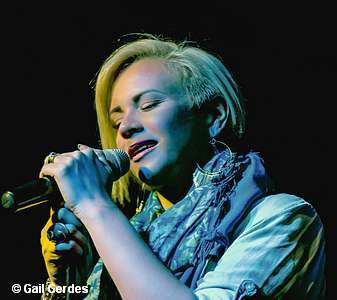 She began to meet local musicians and slowly put herself out there as a singer. But restaurant business was good money that paid the bills. In 2010, she was bar-tending at Tommy Bahama’s when she got an offer for a management position at a restaurant on Siesta Key. The singing and music had been there but it was a struggle to get a project of her own started. She decided to take the offer. After nine months, the owner of the company unexpectedly let her go. “I didn’t realize at the time how miserable I was. It took getting out of that situation to make that clear. After nursing my bruised ego for a few days, I called my long-time friend, Michael “The Professor” Hensley, a great Hammond organ player. He encouraged me to take charge. We had enjoyed working together in several cover bands and had a mutual admiration for each others’ talent. We began rehearsing in April of 2011 – our first gig was in August of that year. It has been six years since I stepped out on the stage under my own name and I haven’t another job since then. Michael insisted that my name was out there, saying that I would be the reason people came to hear the band. I am very grateful to him for that encouragement”. There is one singer that has always been a major influence on Mitchell’s singing. “At the top of the list is Etta James. She had that low register which I identify with. She had a way of presenting a song that really got down to business, digging in and touching the emotions and the meaning of the song. She was able to interpret brilliantly. On her Live From San Francisco album, she did a cover of the Eagles “Take It To The Limit” that gives that song a whole new meaning. That is the way the song is supposed to be sung, as far as I’m concerned. For Desire, a bunch of the guys I recorded with had worked with her. They told me some stories, how she didn’t take any prisoners. I don’t do that either. Other favorites are Otis Redding, Aretha Franklin, and lately a newer artist doing modern neo-soul, Anthony Hamilton. He has a killer voice”. Mitchell released her first album, Please Come Home, at the start of 2013, getting lots of praise from her growing fan base but many felt that the disc did not capture the energy of her live show. In May, 2014, she recorded a live show at the legendary Bradfordville Blues Club in Tallahassee, FL that documented the energy of her show to the delight of her fans. Since then, life has been a series of ups and downs. Her partnership with Hensley came to an end, leading to a decision to change her approach to the band. “I had never been on stage over the years with out a keyboard. When you work as a classical soloist, the piano is always there to accompany you. That was a really scary thing. It changed to whole vibe of the band’s sound with guitar, bass, and drums. I was hearing things I had never heard musically before. It worked out but I really enjoy it when I can add a keyboard player. You miss having those big, fat chords from the Hammond organ. It was a scary leap. But I learned that maybe I was holding on to some things, that I am a lot stronger than I thought I was”. All of pieces came together for her latest album, recorded in Los Angeles with Tony Braunagal producing. She had been working on songs with Hensley while searching for a producer who could help her articulate her vision. Discussions with numerous people went nowhere due to various reasons, including scheduling. That all changed after a performance at the 2015 Suncoast Blues Festival in Sarasota. “To stay relevant, I knew I needed to put out a new record, to give your fans something to listen to. Our set at the Suncoast fest featured a lot of my original material. My friend Jack Sullivan, the publisher of Blues Music Magazine, was there and told me that he was going to contact Tony about producing my new record. I thought, yeah, right, Tony doesn’t know who I am. Several months later I saw Jack again. He handed me Tony’s phone number and e-mail address, telling me to call him. It something like six months for me to get the nerve to do something. I finally decided to send Tony an e-mail because it was safe. I didn’t have to open up, be vulnerable. To my surprise, he answered me about thirty minutes later. I was so excited that someone of Tony’s stature was interested in working with me”. That began the process of selecting songs, setting up budgets, and getting finances to make the project possible. Once everything was set, Mitchell flew to Los Angeles for a week of recording in October last year, an emotionally taxing experience made easier by the by the consummate professional musicians she was working with, including numerous members of the Phantom Blues Band and Josh Sklair, guitarist and the leader of the Etta James band for twenty-five years. “Tony brought years & years of experience. The way he orchestrates things, and deals with people, is genuine. He is incredibly gifted, has a cohesive vision, and hears everything. He knew exactly which musicians to use. His best attribute is that he cares and understands you as an artist as well as a person”. Interviewer Mark Thompson lives in Florida, where he is enjoying life without snow. He is the President of the Board of Directors for the Suncoast Blues Society and the past president of the Crossroads Blues Society of Northern Illinois. Music has been a huge part of his life for the past fifty years – just ask his wife!